Charlie Hunnam is clearing the air. The Sons of Anarchy actor exclusively broke his silence to E! News after stepping down from the role of Christian Grey in the film adaptation of Fifty Shades of Grey. The Hollywood hunk made his first public appearance since the news broke at the 2nd annual "Hogs for Heart" event benefiting One Heart Source Education Programs in Africa at Mo's Restaurant in Burbank, Calif.
Charlie joined his SOA cast members as they hosted the evening's festivities. So how is he holding up since dropping out of the highly anticipated flick? "I am doing good. I am just really concentrating on work. It's been a really busy time," he said. "I have had some family stuff going on so just trying to stay focused and stay positive and keep trying to do a good job at work and be with my family and stay positive." E! News has learned that Charlie's father, Billy, had passed away in May of this year and that the actor traveled back to England to be with family at the time. 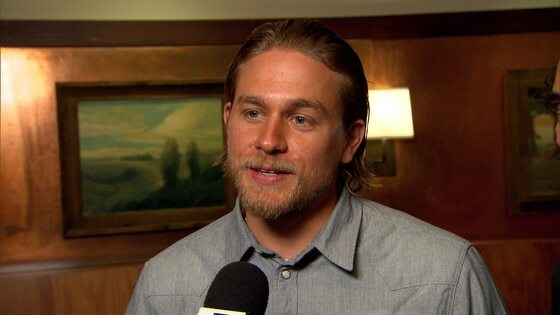 Charlie's currently wrapping up season six of the hit FX series and explained what he plans on doing before his final days as Jax Teller. "Like I said, I've got some family stuff I have to tend to. So when I wrap the show, I am going to go to England and see my people and then I have a film that I am doing with Guillermo [del Toro]. So I am going to go and do that and concentrate on the final seasons of Sons." The Brit also explained how difficult it's going to be to finally say goodbye to his costars. "It's obviously going to be a really emotional time for us. We are like a family and have become very, very close and become dear friends to each other so it's going to be sad and finish up and say goodbye to everyone, but we've got like 13, maybe even a few more, episodes," he said. "There's rumor that we might do a couple of more episodes and do a little bit of an extended season next year, so we will see if that happens. It may or it may not. But I just want to finish that strong and go on to a new chapter of life." The fundraiser, which raised a total of $90,000, was a massive success thanks to the help of Charlie and the rest of the cast. Every child featured at the event was sponsored in at least one category (academically, medically or nutritionally), and the 33-year-old star himself sponsored three children. Charlie spoke about one of the kids he sponsored, Simon, who is 13 years old. "He's an orphan, he lost his mom and his dad and was living on the streets, never been to school a day in his life. Then they found him, this organization," he explained. "We just want to make as much money for these kids as possible." One Heart Source's Kyla Coates, daughter of Sons actor Kim Coates, was especially thankful for the cast being involved in the charity. "We couldn't do this without them and all of their support," she said. "But tonight," Kyla added, "is really about all the work we do in Africa, specifically in Tanzania and South Africa and we really strive to empower vulnerable communities through education. So [we do that by] giving children—and all the community members—the tools and support that they need to empower themselves and really become productive members of society and just get uplifted and become confident and powerful."